These carved figures, both of women, occupy niches above doors of historic buildings in York. On the left, Anne Middleton, in Skeldergate. On the right, Mary Wandesford, in Bootham. Both commemorating the benefactress who established these almshouses (or ‘hospitals’ as they were usually called, when originally founded). The word ‘almshouse’ sounds strange and ancient, and indeed these establishments were founded some centuries ago. 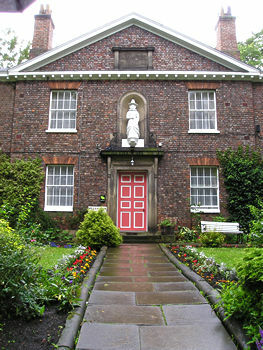 Almshouses provide accommodation within the community for needy people, mostly elderly, and were established to provide care and shelter in the days before the welfare state. York has many buildings which were, or in some cases still are, almshouses, and I couldn’t help but notice that many of them were set up by women. Baines Gazetteer of 1823 backs up this impression, stating: "The ladies of York have contributed essentially to swell the number of the public charities of this city, and their benevolence has in several instances embraced more than one institution." In her will dated 4th of November 1725 Mary Wandesford left a bequest to fund this attractive building, built around 1740. It remains set back from busy Bootham, with a lavender-lined path to its front door. The name nowadays is Wandesford House, but it was known as the ‘Old Maids Hospital’. It’s a good thing, isn’t it, that language evolves and terminology changes, as I can’t imagine any unmarried lady of mature years would want to be labelled as an ‘old maid’. 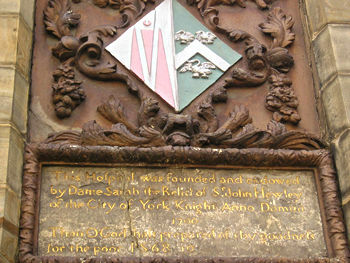 Anne Middleton’s establishment was originally founded around 1659 for twenty widows of York freemen. 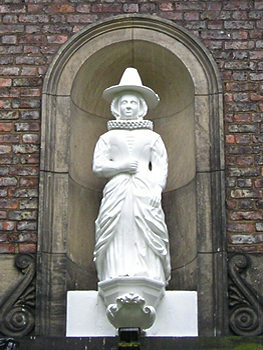 Mrs Middleton was the widow of Peter Middleton, Sheriff of York in 1618. It was rebuilt in 1828-9 – the building pictured here – and altered in the 20th century. The carved figure is thought to be from the original building (though its bright white paint maybe makes it look more recent). It’s now a hotel – and has been so for as long as I can remember. 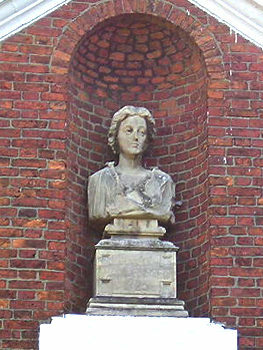 Another female benefactor was Dorothy Wilson – her almshouse and schoolroom stands to one side of Foss Bridge, where Walmgate begins. It was converted to flats some time ago, but still carries the carved inscription recording the foundation in 1719 of Dorothy Wilson’s Charity for the ‘Maintenance of ten poor Women as also for the instruction in English, Reading, Writing and Clothing of twenty poor Boys for ever’. 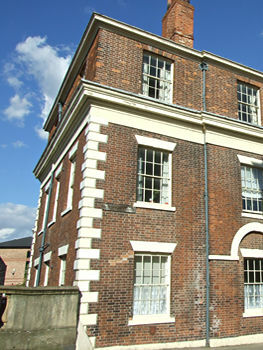 The almshouse was established in 1765, and extensively rebuilt in 1812. It was obviously still quite new when described, in the Baines’ directory of 1823 as "a neat brick-building of modern appearance, very convenient to the inmates, and rather ornamental than otherwise, to the part of the town in which it stands." There’s a lengthy memorial tablet to Dorothy Wilson on the wall of St Denys Church, just along Walmgate, difficult to read but it’s clear that this lady did good things in York and beyond. At Skipwith she founded a school – the church hall (a former school building) commemorates this. 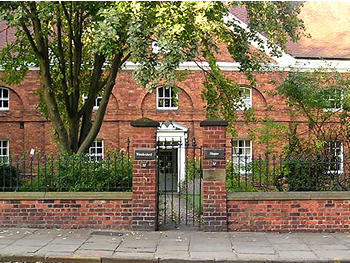 Next to the church on St Saviourgate is this narrow building, the warden’s house to Lady Hewley’s almshouses, situated behind this St Saviourgate entrance. Lady Sarah Hewley (1627 – 1710) was the only daughter, and heir, of Robert Wolrych, and married to Sir John Hewley, MP. The stone tablet records the foundation of Lady Hewley’s Hospital in 1700. The almshouse gave preference to religious ‘dissenters’, mainly Unitarian initially. It was originally located in Tanner Row, but had to be relocated when its land was needed for the railway station (the earlier station inside the city walls). These buildings date from 1840. I have tried to find out more about the family history of Anne Middleton and her husband the sheriff of York . I have been researching saint Margaret clitherow whose maiden name was Middleton . My question is , is she related to Peter middleton sheriff of York . I have been to the town library but they could not help . Can you shed any light on this ?? I can’t Christine, but perhaps someone else can, or you can maybe try the local family history society: http://www.yorkfamilyhistory.org.uk/ ?